Major General Stanisław F. Sosabowski, who was born in Stanisławów on 8 May 1892, was the first commander of the 1st Polish Independent Parachute Brigade. In 1941, when he took command of this unit, he had already had a long military career. After serving in the Austro-Hungarian army during the First World War, he joined the Polish army after Poland had regained its independence in 1918. After a successful career, during which he wrote a number of military manuals among other things, he was, in January 1939, appointed in his rank as colonel to the commander of the prestigious 21st “Children of Warsaw” Infantry regiment. When the Germans invaded Poland in September of that year, the regiment, under his command, was involved in the defence of the country’s capital city. Sosabowski was awarded the highest Polish honour for bravery for his contribution to the battle. He escaped from captivity as a POW and, after a long detour, he arrived in France. There, he witnessed the German invasion in May and June 1940 as the Deputy Commander of the 4th Polish Division. After the battle in France had been lost by the allies, Sosabowski and a large number of his countrymen left for Great Britain. It was there that he began building ‘his’ parachute brigade in 1941. Sosabowski revealed himself to be a determined and self-willed commander, who ruffled his superiors’ feathers on several occasions. His men were devoted to him due to the fact that he showed himself to be an inspiring, caring and, at the same time, demanding leader. During the run up to Operation Market Garden, he was irritated by the optimism with which British commanders viewed the operation: he warned that the Germans would not be beaten easily. During his brigade’s deployment at Driel in September 1944, he showed himself to be a brave and skilful leader when doing everything possible to succeed in his assignment of reinforcing British airborne troops at Oosterbeek. Several times he had heated exchanges with his British superiors, who, to put it mildly, showed him little courtesy. 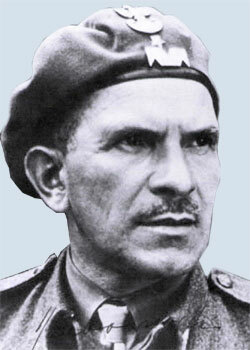 After Operation Market Garden, Sosabowski was, at the insistence of the British general F.A.M. Browning, relieved of the command of his brigade by the Polish governmentin-exile after relations had reached breaking point. After the war, it was impossible for Sosabowski to return to the newly communist Poland. He lived in exile in Great Britain where he made his living as a retailer and factory worker. In those years, he regularly returned to the Netherlands to attend commemmorations of the Battle of Arnhem. He was, for example, a guest in Driel in 1961 where he attended the unveiling of the monument in honour of the Polish parachute brigade entitled “Surge Polnia” (“Poland will rise again”). Sosabowski died in 1967 due to a heart condition.